There is the most easily googled and accessible Hal Higdon plans, the Runner’s World plans, the Nike plans, the Run Less but Faster plans and the list is endless really. Realistically, for a mom who has one or more toddlers these plans do not make sense. We know life is so unpredictable with kids. They have tantrums, get sick all the time and want you for every single thing, from tying shoelaces to having to sooth them to sleep. How is it possible to do intervals every Thursday and a long run every Sunday and tempos every Tuesday with strength training and easy runs in between? Yea right! It is a big help if there is anyone to keep them entertained and fed while you train. In my case, because my husband also runs and we live in a nuclear family it is either one of us who has to be with the kids. So we take turns during the year, and both of us cannot run the same marathon obviously. So I spoke with Habari Warjri, who trained for her first full marathon with her babies by her side! Habari,ran the Pinkathon with her baby. She definitely looks thrilled. Getting to the hardest part, how to start training. It is indeed an effort to set your alarm for 3.30am to get up in pitch dark and put in as much of a workout as possible before the kids get up and mine get up at 5am. It is good to start with a training plan, schedule intervals, tempo runs and long runs during a week and try to stick with it. However if you have to miss a day because you had a sleepless night watching over a sick child do not fret. Missing a few days of training is ok.
Finding a place to run where you waste the least time traveling is also an issue for most moms. I have a treadmill at home and do all easy runs and tempo runs on it. It is best to do intervals on a flat road or a track. I live in Shillong where all we have are hills but fortunately a lovely track but which is a good 20 minute drive away from my house and longer with traffic. So on interval days I take my kids along and they hang out on the track too be it rain, hail or sunshine! The kids love it and its motivation for me too to have my kids around while during hard intervals. The long run day is the hardest to schedule. So, I choose the day my parents are not working and go drop of the kids at the grandparents every Sunday. My husband who is not comfortable with me running around deserted roads on my own accompanies me on long runs, which I do at a university campus, which has less traffic, lots of challenging hills, dense forest and a few snakes too. The post long run recovery can be painful especially if it is those 22milers. Having to go home and take care of the kids right after can be quite the task. But this is what makes us stronger! I cannot stress the importance of a strength training routine for all runners and especially for us moms. After childbirth our body undergoes a lot of changes and rebuilding strength especially core and lower body prior to increasing mileage is very important. I learnt the hard way. After having had 3 c-sections, my body took a beating. Though I focused on training runs, my strength training, which I did a few times of week, was not enough to rebuild my core and back to keep up with the increase in mileage. After running two full marathons I ended up with knee and back problems. After evaluating my injuries and my training I have decided to scale back and build strength first. I have not run more than 5km in the last 6 months. Yoga helped me get my back whipped into shape and now I feel ready to start training again. The kids are older but still 3 and 5 years and they are just all over the place. I let them be my motivation to be healthy and look forward to my next race after being full trained. As understood in a conversation with Habari. Habari is a full time mom to two toddlers. She lives in Shillong. She has run marathons around the world. She, along with her husband Gerald is a marathon organiser. 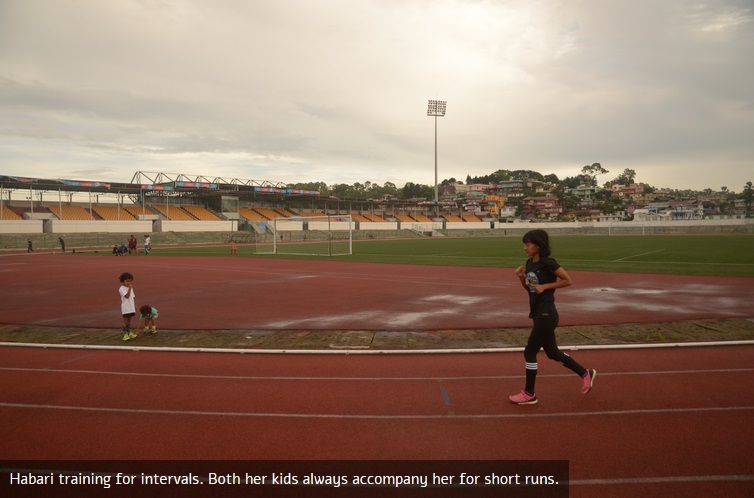 In 2014, she planned and executed the first half and full Marathon officially recognized in the North-East under the name of “Sohra Cherrapunji Marathon”. In just its 3rd year since its launch Sohra Cherrapunjee Marathon route has been certified by the United States Track and Field Association. This makes it a Boston Qualifier Course and qualifications to all the major marathons in the world. It is only the 3rd course in India after Standard Chartered Mumbai Marathon and Spice Coast Marathon which runners can participate in and try and meet the Boston Marathon qualifying times which have very strict selection criteria – one of which is that the marathon course has to be certified. Habari, Great article! My wife is a runner too and as we also have 3 small kids, this article really is impactful and meaningful. I really enjoyed the part about strength training. As someone who works with athletes everyday Im happy to see when attention.is given.to this important aspect. Great stuff you and your husband are doing. Keep up the good work and God Bless! You guys are indeed an inspiration!